A journalist turns to color therapy to transcend her emotional pain in this eclectic novel. In the mid-1990s, middle-aged Iris Miller works for Northern California–based Eco Planet magazine, and she obsesses about her former lovers, her desire to change the world, and her longing for celebrity and wealth. She used to foster kids but was blacklisted by local agencies after she told a social worker about how much she wanted a child of her own, which caused the worker to cite “boundary issues.” She then adopts a baby, whose teenage mother quickly has a change of heart. Iris also has a serious relationship with a man named Felix Moss, who dies of colon cancer. As a member of a Jewish family ravaged by the Holocaust, she’s tortured by her friend Ephraim Kiever’s disclosure that his grandfather was a member of the Nazi party. Later, she attends a Native American peyote ceremony. There, she has a vision of a route to peace in the Middle East, involving the construction of a sweat lodge in Jerusalem, open to members of the three Abrahamic religions. 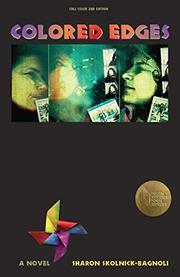 She writes a story based on the vision and travels to Israel to accept a Jerusalem Post award for it. However, two friends whom she invites get kidnapped by the Palestine Liberation Organization. Throughout her trials, she uses color therapy, an alternative medicine treatment that’s said to help heal the body and mind. Author Skolnick-Bagnoli (Shiny Objects, 2009, etc.) has produced an imaginative, discursive, and rollicking tale. Her account of Iris’ turn to color therapy is intriguing, and the book includes a full-color appendix that asserts the healing properties of different hues. However, the plot is so scattered that it seems more like a fragmented series of impressions than a novel, leapfrogging from one thought to the next. Also, although the writing can be refreshingly quirky (“her cougar inclination to pursue the dashing alpha male had remained intact”), it’s never clear how much of the story is intended to be comic, and the vision at the heart of the story is borderline incomprehensible. An entertainingly creative work, but one that lacks coherence and plausibility.